This well known engraving by Alexander Slade dated 1754 has been frequently reproduced over the last 250 years. The idea of arranging the material in a lodge in the form of a man has popular appeal and has engaged generations of freemasons. On one side of the frame hang the square, level and plumb rule and on the other side hang the square, compasses and Bible. The legs are the two columns of the Jerusalem temple to represent stability. On them rests the English Bible, which is at the centre of freemasonry. Buidler's squares form the arms, to suggest square conduct. On them rests a builders's level to support the head to illustrate that freemasons are level headed. 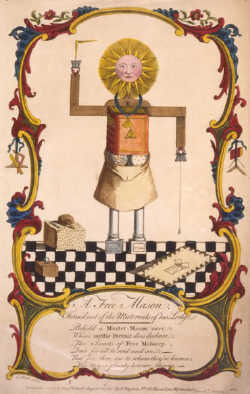 A lewis forms each hand; one supports compasses, form the other hangs a plumb line, which indicates that freemasons are upright. The lambskin apron is the badge of innocence and the bond of friendship. The floor of black and white square tiles were typical of classical architecture of the Renaisance, which was introduced to England by Inigo Jones and used by Sir Christopher Wren in St Paul's Cathedral. On this pavement are placed the rough ashlar on which is a gavel and chisel, a perfect ashlar in which is inserted a lewis, and a drawing of the the 47th Proposition of Euclid.